Times of the Islands – What’s SUP? 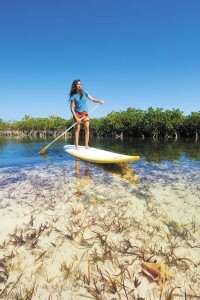 A stand up paddleboarding adventure in the Turks & Caicos Islands. The sea is calm as we silently slide our Naish paddleboards into the water. With a laugh that breaks the silence, we stand up and paddle away. We are leaving the Big Blue dock in Leeward, headed for the mangroves on the other side of Leeward Channel. I am SUPing (stand up paddleboarding). This involves me standing on a large board, similar to a surfboard, and propelling myself along with a canoe paddle! As we cross Leeward Channel, the water becomes darker with an uncountable number of shades of blue as the depth deepens. A black shadow passes underneath. Is it Jojo the dolphin? We hope so! Winding our way among the mangrove shallows we come upon a deep pool. A turtle skittles away, and a baby lemon shark swims along the mangroves, hardly noticing us. As we turn the corner, a group of herons flutter away. Only the splash of our paddles breaks the silence. 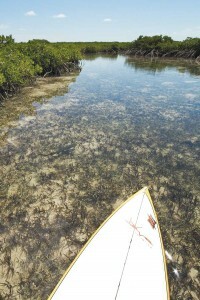 After skimming along the mangroves, we continue our journey onwards to Little Water Cay. We paddle into a lagoon behind Half Moon Bay, and easily carry our Naish paddleboards across the island. We receive curious stares from the resident (and endemic) Turks & Caicos Rock Iguanas. They make no attempt to run away, but their looks make us feel like intruders on their private sanctuary. The north shore side of Little Water Cay appears completely different from the lagoon. Waves break on the white, crest-shaped beach that describes its name, Half Moon Bay. The white sand resembles a half moon, with the ocean as the sky. The afternoon sparkles off waves and creates shining stars. We put our boards into the water and push off. The water is deeper, and has a swell to it. This side has a completely different feel—dark swells contrast to the calm, peaceful shallows. I sense that we’ve seen the best of both worlds. Continuing along our way we return to Big Blue’s Dock just before sunset. It has been an exciting and truly unique experience. Standing on the paddleboards offers an amazing vantage point of the wonders beneath the our pristine sea. Big Blue Unlimited offers daily tours and instruction into the mangroves of Leeward, and also has Naish paddleboards available for rent. They also sponsor an SUP and Kayak Paddler’s Club. No experience is required. SUPing is very easy, and all ages can get involved! For more information on paddleboarding excursions contact Big Blue Unlimited at www.bigblueunlimited.com or (649) 946-5034 or Abuv It All Watersports at www.windsurfingprovo.tc or (649) 241-1687.